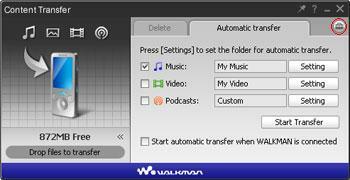 Converting video to WMV format for playback on the WALKMAN using Content Transfer. Please follow the steps below to convert video to WMV format using Content Transfer Version 1.3 application. Note: Please click here to download Content Transfer Version 1.3 application. Connect the WALKMAN to a USB connector of your computer. Your WALKMAN may need a dedicated USB cable to connect to a computer. Refer to the Operation Guide of your WALKMAN to connect to a computer. After connecting, Content Transfer starts automatically. Tip: In the Start Menu, you can also click All programs - Content Transfer - Content Transfer to start the software. Select the desired data from Windows Explorer, and drag it to Content Transfer. To transfer more than one file, select the desired files (while pressing the CTRL key) from Windows Explorer and drag them to Content Transfer. For DRM (Digital Rights Management, copyright-protected) content, only Windows Media DRM files (e.g., WMA, WMV) are supported. The number of times you can share and play DRM files may be limited depending on the content type, and you cannot exceed the limit. Disconnect the Walkman from the computer and playback the Video. Note: To change video settings, click on button from the expanded main screen. In the Options screen, select the Video tab. Turn on automatic video conversion: When checked, automatically converts unsupported video files to playable files on your WALKMAN. 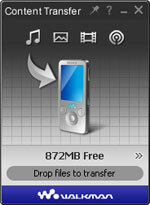 Priority - Image quality: When checked, converts the size to correspond with the connected WALKMAN's playback performance. Priority - Size: When checked, always adjusts the size to less than QVGA (320×240). 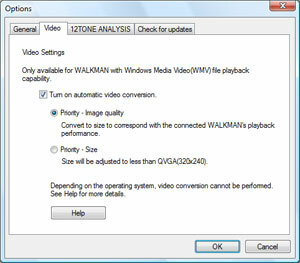 Unsupported Windows Media Video (WMV) and MPEG1 files are converted to playable WMV files automatically. To convert video file in other than WMV or MPEG1 format, decoder software is required.